Vacuum Chambers are designed for moisture/particle sensitive materials, such as, biological testing, vacuum testing, vacuum sealing, vacuum drying, and vacuum encapsulation. Ideal for storing and transporting samples under sustained low and intermediate vacuum pressure. 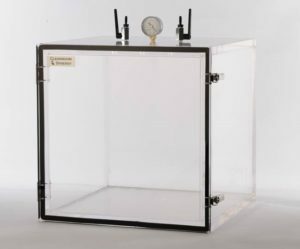 Cleanroom Synergy vacuum chambers maintain vacuum level down to 29.9″ Hg. Vacuum chamber gauge and metering valves are included for flushing the chamber with purge gas prior to use. 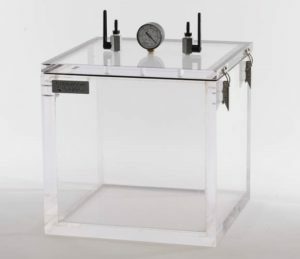 Our vacuum chambers are available in clear or amber acrylic with door options of front loading AVF series or top loading AVT series. Also offered in custom sizes to meet your specific project requirements.